ToolbarButtonAdvanced: The advanced Toolbar buttons are based on YUI Buttons; they are more richly featured at the cost of more dependencies. Choose the right combination of features in your Editor and Toolbar to get the right tradeoff between size and richness for your application. 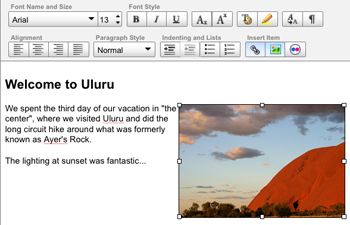 Examples: Explore examples of the Rich Text Editor in action. API Documentation: View the full API documentation for the Rich Text Editor. Release Notes: Detailed change log for the Rich Text Editor. Download: Download the Rich Text Editor as part of the full YUI Library at YUILibrary.com. The major difference between the two editors are their dependencies. This text will be pre-loaded in the editor when it is rendered. The full list of configuration options that you can pass in your constructor can be found in the API documentation. You render the SimpleEditor Control the same as the Editor Control, only you call the SimpleEditor constructor instead. There are a couple of ways to get the data from the editor. The first way is to let the Editor do it for you by setting the handleSubmit configuration option. Setting the handleSubmit configuration option, the Editor will attempt to attach itself to its parent form's submit event. Then it will call its saveHTML method, then proceed with the form submission. The default toolbar included with the editor makes every currently supported feature available by default. You can override this config before the editor is rendered by passing in an object literal of a new toolbar to the constructor. The Editor's Toolbar supports 2 types of buttons: advanced and basic. Note: To use the advanced button type you will need to make sure you include the Menu and Button Controls. Push: Push buttons are provided via the YUI Button Control. Menu: Menu buttons are provided via the YUI Button Control. Select: The Select button is a hybrid of the menu button that mimics an HTML <select> element. Color: The Color button is another hybrid menu button that contains an interactive color picker; note that this color picker is not an implementation of the YUI Color Picker Control but rather a dedicated text-editing control optimized for styling text. Spin: The Spin button is a hybrid of a Push button that adds a pair of up and down arrows to the side of the button. It is generally used to allow the user to select a value from a range of numeric values. Selecting one of the buttons causes the value to "spin" up and down the range of possible values. Separator: The Separator button gives you a way to place a bar ("|") in between two buttons. The separator bar is also given a unique classname so you can use it to style the toolbar as needed. Push: Push buttons are provided via the default toolbar. Menu: Menu buttons are provided via the default toolbar. Select: The Select button is an HTML <select> element. Color: The Color button is a hybrid menu button that contains an interactive color picker; note that this color picker is not an implementation of the YUI Color Picker Control but rather a dedicated text-editing control optimized for styling text. Example code for each of these button types is included in the toolbar section above. You can also see a few examples of using the different button types in the Editor's example section. The Rich Text Editor and the Toolbar are both loaded with Custom Events to which you can subscribe as you customize the editor's behavior to suit the specific needs of your application. Dynamic Events are special CustomEvent's that are dynamically created based on the value of a button in the Toolbar. For example, if you had a button called "bold" you will be able to listen for the "boldClick" event or if you had a button called "foo", you would be able to listen for the "fooClick" event. Please refer to the API documentation for a full list of Custom Events that are available for the Rich Text Editor. The Rich Text Editor's toolbar has a flexible plugin architecture that allows you to customize the editor's behavior for the purposes of your own application. The example below will add a new button to the default toolbar. When this custom button is clicked it will insert the following HTML: "<b>This is the text to insert.</b>" But the button will only be enabled if the user has focused a <div>, so this text will never be inserted into an element within the editor other than a <div>. //Add the button to the toolbar; "this"
//Now listen for the new buttons click and do something with it. The Rich Text Editor uses a method based approach for applying execCommand commands on selected text/elements. For example, when you call myEditor.execCommand('forecolor', 'FF0000');, the editor actually calls an internal method called cmd_forecolor. This method will then process the command and act on it. It will return an array telling the execCommand method whether it should or should not execute the document.execCommand method. Below is an example of the cmd_forecolor method. Using this technique, you can add support for your own execCommands, or change the way that the Editor handles them. If you're intereseted in extending the Toolbar with custom buttons (see the Flickr and Calendar examples that do this), the following section contains important information. The nodeChange event is your way of knowing when an interesting moment occurs inside of the Editor. Keep in mind that the editing canvas itself (the place where the user is inputting rich text) is, under the hood, an HTML document loaded within an iframe with designMode turned on — which is to say it has a DOM full of nodes. When the user is typing, she is adding to a single DOM node. But when she mouses to a new location, selects new texts, or performs any other action that changes the cursor's current position in the DOM, the nodeChange event fires to let you know that the user appears to be performing an interesting action. Common user actions that can fire nodeChange include mousedown, mouseup, arrow keys and other keypress events. Can be enabled or disabled depending on the state of the editor. This group is enabled when the user has selected content in the editor and disabled when the user is merely typing. Always enabled. The "show hidden elements" button, for example, is always enabled. Always disabled. By default, there are no buttons that are always disabled; under some specific circumstances, there may be times when you want to place a custom button in this category (eg, if you've added a feature that is not always available to all users). Disable all buttons in the array. Enable each button NOT in the _alwaysDisabled object. If a button is NOT in the _alwaysEnabled object, it will deselect the button. For custom buttons that you add to the Editor, it is best practice to subscribe to the afterNodeChange event and update your button's enabled/disabled state at that time. See the Calendar example for sample code that allows you to do this. 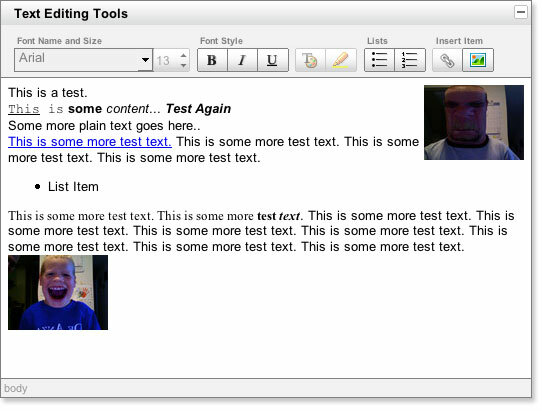 The Rich Text Editor includes two convenience methods used when showing and hiding the editor. The methods are show() and hide(). These methods do not control the display properties of the editor. They are designed to plugin to an event given by the editor's parent container. 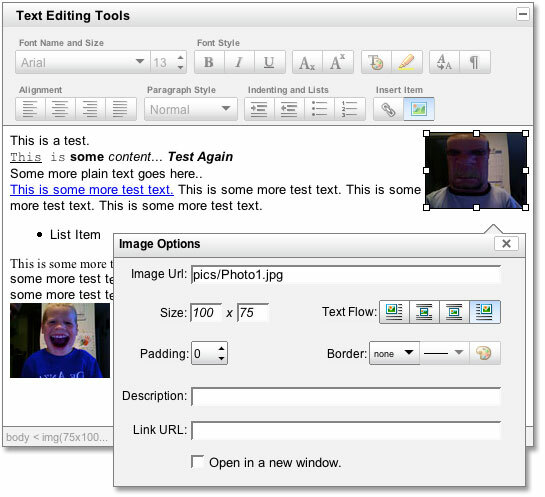 See the Editor inside a TabView control example here for more information. 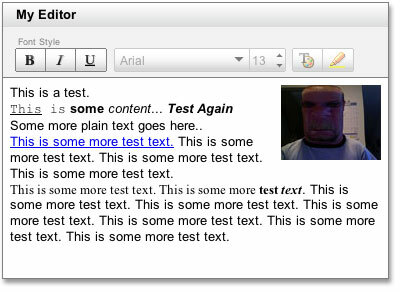 By setting the editor's container or a parent element of the editor to display none, the editor can become un-responsive. So using the show method will allow the editor to fix itself and start behaving again. On the other hand, you don't want the editor doing any processing when it is hidden. So calling the hide method will close all open editor windows and stop all background processes and timers. The Rich Text Editor comes with a default presentation or "skin," part of the "Sam Skin" visual treatment that accompanies most YUI controls. You can read more about the general approach to skinning YUI components in this in-depth article. The CSS provided with the Rich Text Editor is comprised of core, functional CSS as well as the Sam Skin visual treatment. To explore the CSS which controls the Rich Text Editor's presentation, please review the Rich Text Editor's Skinning Example wherein the full CSS for the control is displayed. For your convenience we have provided the Rich Text Editor's sprite PSD file in a zip available here. The YUI Rich Text Editor does not currently support the iPhone or the Nokia N95. Due to the interaction model (specifically, the inability to make a selection), the Editor will not function as expected. In our tests, it appears that the Apple and Nokia Webkit implementations don't event recognize the Editor as an editing field — meaning that these browsers are, at present, deliberately not supporting the use of an iframe in design mode. The best way to get around this is to not render the Editor when you come across one of these browsers. Take a look at this example of browser detection in the Yahoo Global Object for ways of doing that.